My youngest son is a busy little guy. He’s been that way since he was born. I have to stay a few steps ahead of him and keep him engaged or else he’ll seek out trouble. On days when I engage him first thing in the morning, I can tell a difference in the rest of the day. That’s why I’m always on the hunt for clever crafts and activities–SANITY! 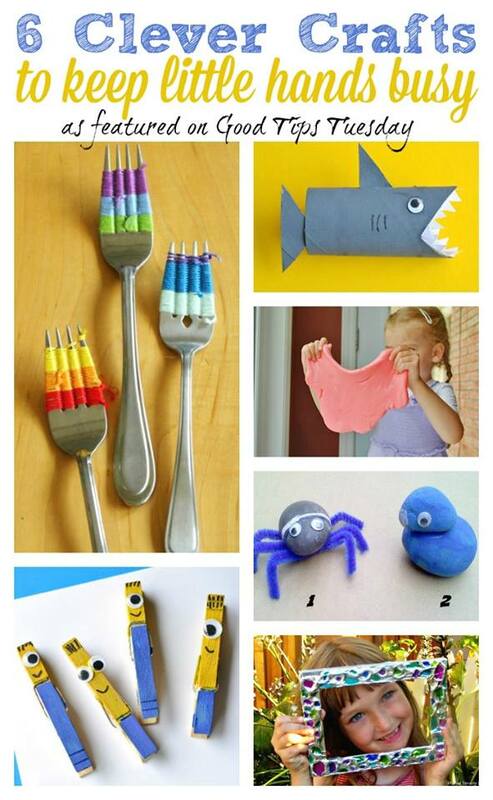 Today we’re featuring 6 Clever Crafts to Keep Little Hands Busy that were linked up in last week’s Good Tips Tuesday. We want this to be a resource for you to find Good Tips for your life, home, kids and everything in between! So what kinds of posts are you able to link up now? Check out this awesome list! Now let’s get to today’s Good Tips Tuesday party! Please link directly to your post, not to your main blog page. All links that do not follow this will be deleted. Visit other posts in the party, comment, tweet, pin and let them know you came from GTTuesday! We will feature 4 posts each week, picked via random.org. We will each be picking our favorite post from the week and pinning all of the featured posts and favorite posts to the GTTuesday Pinterest Board! Follow Heather @ Golden Reflections Blog’s board Good Tips Tuesday #GTTuesday on Pinterest. By linking up and including a picture, you agree to allow Golden Reflections Blog, Simply Sherryl, A Bird And A Bean, & Happy Brown House, A Diligent Heart, The Gracious Wife, and Learning 2 Wak to use your pictures and links in future featured post/photo collage like this one. Your photo may also be used for promotion on all social media outlets of all the before mentioned blogs. We can’t wait to see all the amazing posts you will be linking up this week! Thank you for featuring my kids’ crafts! 🙂 FYI, it says the linky doesn’t open for another 6 days…. I fixed it! Thanks for letting me know. Thanks for hosting and thanks for featuring our Nature Number Art Project!